Grazie mille, Steve Manfredi. You’ve helped me figure out my menu for Christmas this year. Manfredi is owner/chef of Osteria Balla, a stylish modern Italian restaurant located at The Star, Pyrmont, in Sydney. I was one of the “guinea pigs” invited to Balla this week to sample a light summery Italian-style Christmas menu, using Australian ingredients. I’ve always thought it odd that we continue to cling so ardently to the traditions of the “mother country”. Given that the temperature usually hovers around 30 ºC, why do so many of us stick with such a heavy menu – hot roast turkey, goose or chicken complete with roast vegetables and gravy; steamed hot plum pudding with custard and cream; mince tarts and heavy fruit cake? We started with a lovely light antipasto of Insalata di frutti di mare, a seafood salad composed of prawns, calamari, mussels and octopus flecked with finely sliced celery and miro herbs, a popular dish in southern Italy. The salad was served in individual witlof leaves making it easy to pick up and eat with your fingers: ideal for outdoor entertaining. Manfredi told us he’d sourced scarlet prawns (gamberi rossi) for the salad. These can be hard to find as most of the catch is exported, but if you come across any at the Seafood Markets, grab ‘em. “I am Italian. And I am a cook. But I live in Australia and whenever I can, I seek out and use only the finest and freshest Australian ingredients,” he says. The salad was dressed with Vannini Osvaldo Extra Virgin Olive Oil, a restrained, elegant oil from Lake Como, northern Italy (he’s not a fan of Aussie olive oils) and served with a 2010 Casa Coste Piane Prosecco Naturale from the Veneto, a delicious light sparkling wine. This was followed by a home-made pasta dish, Cappellacci di burrata e fiori di zucca: “big hats” oozing with milky burrata and zucchini flowers, tossed lightly in a pan with cherry tomatoes and fresh marjoram: the colours of Christmas. It was accompanied by a 2012 Torre Varano Falanghina, a lively dry wine from Campania, southern Italy. And yes, the main course was turkey – Tacchino ripieno – which is served in northern Italy at Christmas, but this was not the whole bird (which requires 3 – 4 hours roasting time in the oven). Just the turkey breast is used at Balla and it’s rolled, flattened and stuffed and each portion is cooked to order, so that it remains moist. It was, served with braised zucchini and accompanied by a 2010 Feudo Arancoi Nero d’Avola., a delightful Sicilian wine with blueberry and cherry notes. 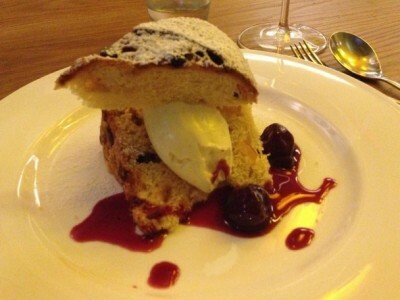 To finish, a fragrant moist Panettone served with a light mascarpone cream and cherries. …..